He reads three or four books a day on subjects ranging from calculus, to organic chemistry, to physiology — his absolute favorite subject. He’s not much of a fiction fan, though. Biography is more his bent, having recently completed ones on Alexander Humboldt, Albert Einstein and Stephen Hawking. When he was recently explaining concepts of space and time and relativity to his mother, he abruptly stopped and started to cry. “This is too difficult to try to explain to you,” he said. As for foreign languages, he can read and comprehend English, Spanish, Portuguese, German, Latin and Greek roots. Caelum Dylan Miller is 3 YEARS OLD. On Tuesday, July 21, Caelum will turn four. This certified genius, gift from God and living miracle, however, almost wasn’t to be. Had it not been for the aggressive intervention of his parents and their literal “never-say-die” attitude, Caelum most certainly would have been institutionalized for life, another grim statistic left to a bureaucratic network of a caretakers and case workers. A little light reading for Caelum, age 3. 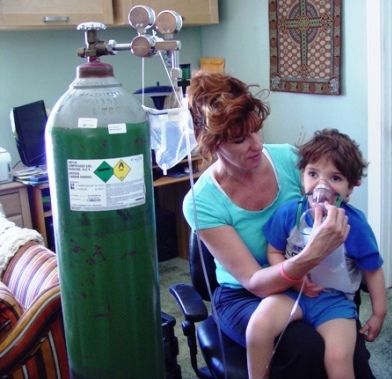 Caelum’s short life-changing odyssey began when he was just 17 months old on Dec. 31, 2006. As part of a relatively new family New Year’s Eve tradition, the Miller/Sinclair blended family of Shawn, Ryan, Adam, Devyn, Jacob and Caelum were inside their Peyton Rd. home preparing to leave for an early dinner at Miyabe’s Japanese Restaurant. Celebrate early and responsibly, and leave the serious partying to the late-night revelers was the thinking of parents Mike and Annemarie Miller. Although Caelum was the smallest in the clan, he was the noisiest, and the parents suddenly realized their full house was far too quiet. In an instant, Mike shot to the side yard hoping to find his son playing. Unsuccessful, he dashed to the backyard pool, where he saw Caelum floating face down. In the time, it takes to brush one’s teeth, tie a shoelace or answer the phone, his son had drowned. Annemarie immediately started CPR. She was a competitive swimmer since the age of 10. 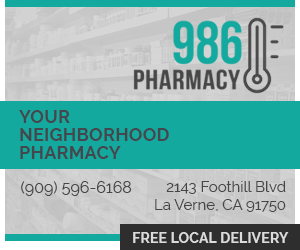 Moreover, she was the wellness director for the Hillcrest Retirement Community in La Verne. She had taught her son Jacob, then only five, how to swim when he was about Caelum’s same age. When the La Verne Fire Department arrived, it took over the resuscitation efforts from Annemarie. Although Caelum had no blood pressure, no pulse and wasn’t breathing, he still had a living chance. He had fallen into a pool that was 38 degrees Fahrenheit. He was hypothermic, a condition that may have forestalled certain clinical death. At Pomona Valley Hospital Medical Center, doctors now worked to warm his body and finally, after more than an hour of lying lifeless, Caelum showed a cardiac response. Amazingly, Wheeler, the Hillcrest Homes’ chaplain, was making rounds at the hospital that night. She knew the Miller family and immediately initiated a community-wide prayer request for Caelum. Stabilized and breathing on his own, Caelum, was transferred to Children’s Hospital of Orange County, accompanied by a doctor, two nurses and Annemarie. Caelum spent the next 30 days there, heavily medicated, connected to a feeding tube, spasmodic and cortically blind, stemming from a lack of oxygenated blood reaching the brain. Caelum prepares for his Peter Pan move. The MRIs and CAT scans returning from the lab were devastating. They showed little hope for any kind of meaningful recovery or quality of life. It seemed that only Mike, a chemist, and Annemarie refused to accept the sobering prognosis and the well-meaning advice of people who suggested they disconnect Caelum’s feeding tube and other life-sustaining machines lest they want to live with a “vegetable” the rest of their lives. Annemarie didn’t see her role changing all that much. Caelum was still a baby, and although his near drowning had severely compromised his current condition, he was still her baby to hold, cherish and nourish, one way or another. As an older parent, with the youngest of her children’s lives literally in her hands, she wasn’t about to abandon him. She would be both his parent and advocate. If Caelum’s medical condition wasn’t all-consuming and threatening enough, she and Mike learned that a Children Protective Services investigation of the accident had begun. Unbeknownst to them while they were camped at the hospital, their sons Adam and Jacob were pulled out of class and interrogated by case investigators who were looking for signs of parental negligence. Not finding anyway, the case slowly faded away, but it was unsettling and unnerving for the Millers all the same. Making matters worse, Annemarie was told that if Caelum’s condition didn’t show improvement in six months, recovery beyond that precious window of time was unlikely. She also consulted a psychiatrist friend who told her to remove all of Caelum’s personal possessions from his hospital room, pray over her son, say goodbye to him and not return for four to six hours. Agonizingly, with Chaplain Wheeler at her side, she told her son that if he was ready, it was okay to go see grandma (who had recently passed) and to not be afraid. An activity called masking to promote deeper inhalations of oxygen. After 30 days at CHOC, Caelum was transferred to HealthBridge Children’s Rehab Hospital in Orange, where he would remain for the next four months. The Millers requested a rolling cot, so that at least one of them could always sleep by his side. Annemarie, a believer in alternative treatments, hired an acupuncturist, brought in colorful mobiles and had specialty lenses prescribed in hopes of increasing stimulation and reopening her son’s brain-damaged neural pathways. Her traditionalist doctors didn’t always agree with her actions. “We trusted our instinct a lot of times,” Annemarie said. 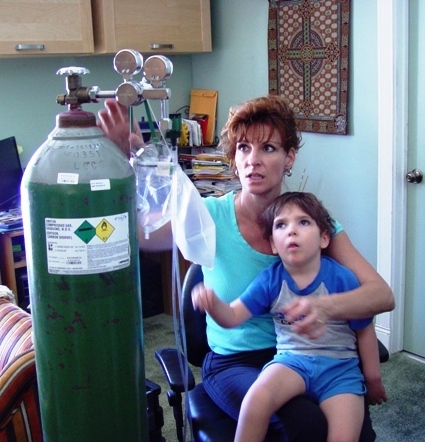 She regularly checked her son out of the hospital and drove him to Fountain Valley to receive hyperbaric oxygen therapy, a treatment first developed for diving disorders involving bubbles of gas in the tissues. “I found few doctors who believed in it,” she recalled. Plus, she had to endure the terror of driving a totally compromised child who was throwing up in the back seat, on the freeway. “It was really scary,” she said. But Caelum started showing improvement. Annemarie records every activity and exercise. On May 10, Caelum came home, the day before Mother’s Day. The day was as terrifying as it was wonderful. “We had his room redone,” Annemarie said. “We brought in a hospital bed, we had a feeding pump, we hired a nurse, we started doing some in-home therapy through the regional center. “Bringing him home was scary but necessary.” She and her family suddenly were thrust into being Caelum’s main support. On top of dealing with the horrible accident and follow-up social services inquiry, she also learned her medical carrier had refused to pay their son’s hospital bills. That was simply one more battle she had to take up in what had become a series of nonstop challenges. “In retrospect, I think God puts a mechanism in your head so you don’t remember everything at once or you would probably just go shoot yourself in the foot,” she said. The homecoming was difficult for another reason. “We all had a feeling of being responsible for it happening because we were all at home,” Annemarie said. “Three minutes and it was over.” Most likely, Caelum had wiggled under a portion of a new fence the Millers had installed around the pool to prevent exactly the kind of accident Caelum suffered. The tank is filled with 80% oxygen. As Hillcrest’s wellness director, Annemarie is constantly looking for breakthrough treatments and exercises to improve the health and fitness of her residents. One day she stumbled onto the website for the Institutes for the Achievement of Human Potential in Philadelphia. 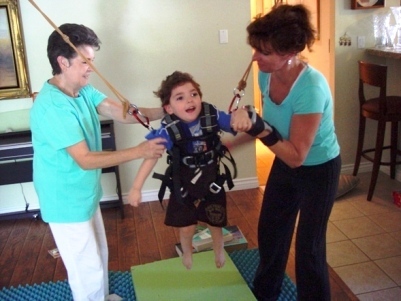 Pa., a nonprofit organization that specializes in rehabilitating brain-injured children. She believed her find was serendipitous because no one she had ever talked to had heard of the place. She immediately began implementing and incorporating some of The Institutes’ recommended treatments and requested a registration packet to attend one of The Institutes’ courses for parents. After learning more about her son’s condition, The Institutes told her to bring Caelum with her at once despite the facility’s usual two-year waiting list. Back in Philadelphia, the Millers sat in lectures for 10 or 11 hours each day. Caelum was also evaluated and a rehab program was personalized for him. One doctor told Caelum to enjoy his last yogurt because his new diet that he was putting him on was free of all dairy, wheat, soy, gluten, peanut, tomato, banana and sugar-based products, which he called the eight worst foods for brain-injured kids. He also said Caelum no longer required a feeding tube or any of the 24 medications he was taking. Now the Millers return to The Institutes every six months, but it’s between those visits and evaluations that the real work is done and continues to this day. A day doesn’t pass without Caelum tumbling, twisting, spinning, stretching, crawling, bouncing and cart-wheeling around the Miller home like Peter Pan. Specific exercises are numbingly repeated to forge new pathways in his brain. 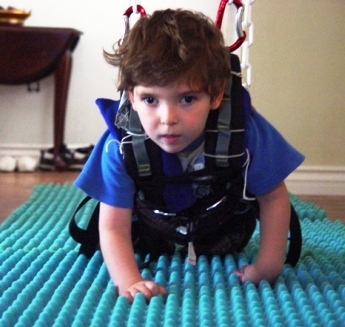 Patterning is a therapy, whereby Caelum with help from family members, simulates the movement of crawling by simultaneously moving his legs, arms and head as if he were swimming on dry land. There was a time when Caelum wore an anti-roll device, just one of the many contraptions the Millers have rigged up in their home. In fact, their entire home looks like a makeshift physical therapy center, with its ramps, swings, ladders, harnesses and mats poking out from every corner. There’s little furniture in the house. 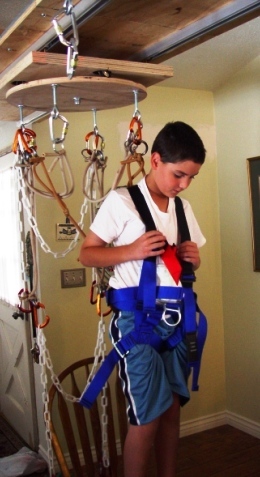 Some of the harnesses Caelum sits in would challenge the dexterity and assembly aptitudes of world-class mountain climbers. 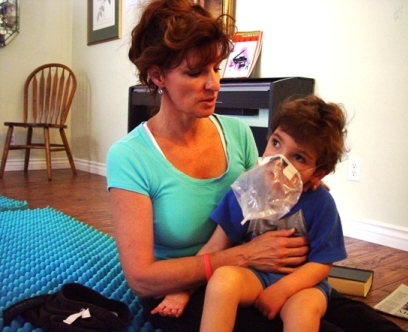 Caelum also does a variety of breathing exercises, all designed to increase oxygenated blood to his brain. The loyal trooper he is, he dons his mask without complaint. He is considerate and compliant, as if he knows this is his best chance for a physical recovery. As for his mental capacity, he is off the charts with an I.Q. above 150. Trapped in his physically challenged body, he is unable to talk but he can communicate at a college or graduate course level. At first, Annemarie and a former daycare owner, Cecilia Gillam, used to convey bits of intelligence on over-sized flash cards, one image per card, such as a single image of a pheasant or a red-tailed hawk with no background. In this way, he learned to identify famous composers and artists. Raphael is his favorite. Then they created simple story books for Caelum. He mastered those as well. It’s called facilitated because the facilitator, usually Annemarie, will pull Caelum’s right arm back and then he will apply pressure on her hand, propelling it forward, like a mystical ouija board or divining rod, until she strikes the letter Caelum wants. It’s tedious, laborious and took Annemarie about six months to get her speed up to keep pace with Caelum’s active mind and imagination. Intelligence outside the norm is great if you’re a NASA scientist, but for the Bonita Unified School District, it could present a problem. He is now a student entering the school system. Placing Caelum in a class of 5 year olds would be like putting Pavarotti in a grammar school glee club. 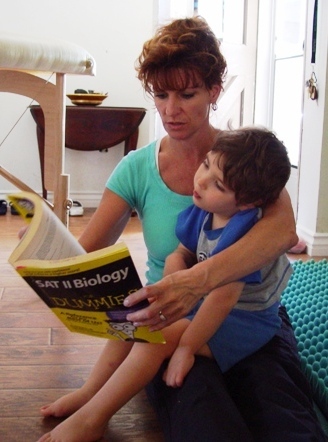 Forget pointing him toward more advanced classes, he could be Harvard-bound at 12 or 14. A master of the multiple choice format, he could take the SAT right now. Perhaps most remarkable of all Caelum’s amazing qualities is the way he reads. As Annemarie flips through the pages, he can extract just the information he needs. It seems the faster the page turner goes, the easier it is for him to follow. He doesn’t need to take the Evelyn Wood speed reading course. He could be teaching it, if only his damaged motor skills improve enough to let him speak. Shortly after Caelum’s accident occurred, Mike and Annemarie were told their family would be torn apart and their marriage would be destroyed if they tried to keep Caelum out of institutionalized care. Just the opposite has occurred. Their family has grown stronger. Jacob’s turn to take a ride. The kids have even adapted to the house rules – no shoes, use hand sanitizer and be positive and happy, and always respectful of one another. All the same, no one’s denying that Caelum’s trial has been tough on the kids. There’s little chance that the boat in the driveway will be pulled to the Colorado River any time soon. In fact, the Millers are thinking of selling it to keep up with mounting medical expenses. Each trip to Philadelphia costs about $10,000 for the week. No doubt his care is taking an exhausting toll on Mike and Annemarie as well. Caelum requires total care, from the moment he wakes until the lights go out until 11 p.m. or so. He now weighs 37 pounds, so Annemarie or whoever is caring for Caelum at a particular moment has to be in good physical shape to lift him several times a day, not to mention, run him through his daily gauntlet of exercises. Two weeks later, Mike called Annemarie to tell her that the man Caelum had identified in the television program had indeed died on November 14, 2005. Caelum’s accident was December 31, 2006. Two days after watching the PBS program, Mike and Annemarie found the man’s song on the internet and started playing it. At first, Caelum was happy to hear it, then he got sad again. He said he was sad because he didn’t get to see his friend anymore. It is these daily surprises and mysteries that make the Millers grateful they didn’t choose institutionalized care for their son. To the Millers, some has always been better than none. Another cozy spot to do some therapy. What an amazing story! This family will be in my thoughts and prayers!! God Bless you all!! I have two sons, a single parent. My oldest son has mild autism and adhd. The LOVE you have for your child is the LOVE I have for mine! We all need to have more compasion and love in life. It goes a long way! Your son will go on to do many more great things! He has been given a gift and he will continue to bring people together with his love and ambition for life!! Your hard work, as his parents, will continue to improve his life, and he inturn will give your family more than you could ever imagine!! Keep up the LOVE and great work!! Thanks for your uplifting story, I will share it! What an awsome family. They are truly amazing. It’s really tough to go through what they have but they are keeping their family together with the grace of God. You are truly an inspiration to all. God bless you and your family. We believe in miracles and so far you have received one of many comming your way. Keep the faith. Very inspirational story and a true testament to a mother’s love. I truly enjoyed reading about Caelum and would love to meet him. May God continue to bless him and his family. I’m sending this out to quite a few people I thought of while reading it. Waking up this morning my mind was set on the struggle of life, even when it is in the best of circumstances. I was wondering what it is all about – thinking about love and it’s commitment and choosing that over the freedom given up to share it. This was one of the first things I came across thereafter. It makes me just want to run to their side and offer whatever help I can. The struggle to pay attention, to do all we can to preserve life, and to appreciate the finer gifts God gives us are all demonstrated in this very personal story. Last Saturday I met a former neighbor’s granddaughter who is majoring in rehab for children with brain injuries, starting at Cal State Fullerton. She has a cousin who is such a special youngster. I told her about your journey, but did not have any current updates. I am passing this article on to her. What an inspiration! God Bless the whole family. This is an incredibly moving and inspiring story! God be with you. what wonderful work you are continuing to do with Caelum. I so look forward to see him soon! You are a blessing in our world, may more parents learn from you. Thank you for sharing this story. My cousin’s daughter is in NICU and is fighting for her life after nearly drowning. Your son’s story gives us hope and strength. Thank you, thank you !